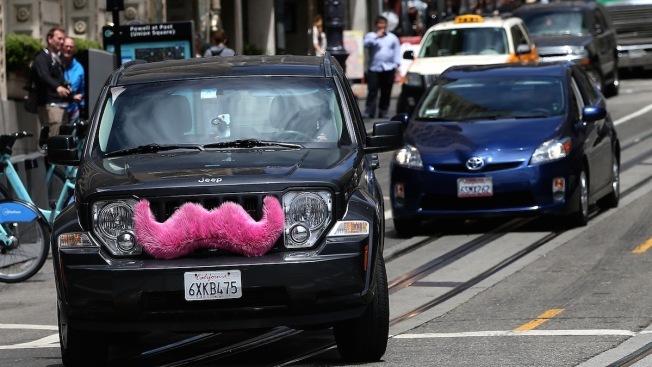 In this stock photo, a Lyft car drives along Powell Street on June 12, 2014 in San Francisco, California. Mobile rides startup Lyft is suing its former chief operating officer, Travis VanderZanden, for downloading confidential documents before joining its arch-nemesis, Uber. VanderZanden is said to have forsaken his "confidentiality agreement and fiduciary duty" a few weeks before joining Uber, according to TechCrunch. He is accused of downloading and taking "strategic product plans, financial information, forecasts, and growth data," according to the complaint filed in San Francisco Superior Court. VanderZanden joined Lyft 18 months ago after Lyft acquired the startup Cherry and was quickly given the COO position where he orchestrated Lyft's expansion. He reportedly left in August after "reported tensions" with Lyft's founders and was hired at Uber a few months later to help with the company's growth around the world. Lyft claims that VanderZanden notified the company of his plans to leave on Aug. 12 and soon after "backed up a number of emails and confidential documents" to his home computer and mobile phone before giving back the computer. Forensic analysis showed that VanderZanden did copy a noticeable amount of documents before his departure. Lyft released this statement: "We are disappointed to have to take this step, but this unusual situation has left us no choice but to take the necessary legal action to protect our confidential information."